Movies At Dog Farm : A Most Gore-geous Day Is Upon Us! That's right, folks! The official start of the Ultimate Gore-A-Thon is upon us! The splatterific extravaganza begins at midnight this Saturday! Things have been quiet at the Dog Farm for awhile, but that's only because we've been gearing up for what promises to be one helluva lot of fun. The proprietors of all eight participating sites have been working hard to stockpile a big, messy pile of gorey horror movie goodness. You'll notice the addition of the Ultimate Gore-A-Thon Most Recent Posts listing to the right, where you can keep up with all the newest posts at all eight sites throughout the next two weeks. You can also check out a master list of all the sites, posts, and links relating to the Ultimate Gore-A-Thon at Blood Sucking Geek. Take a moment to "Like" the new Movies At Dog Farm Facebook fan page while you're in the sideboard, too. On an a somewhat related note: I'd like to call everyone's attention to the trailer currently embedded in Movies At Dog Farm Recommends . . . in the sideboard. Owing to the nature of the Ultimate Gore-A-Thon, I found myself revisiting this incredible three disc set for reference recently. 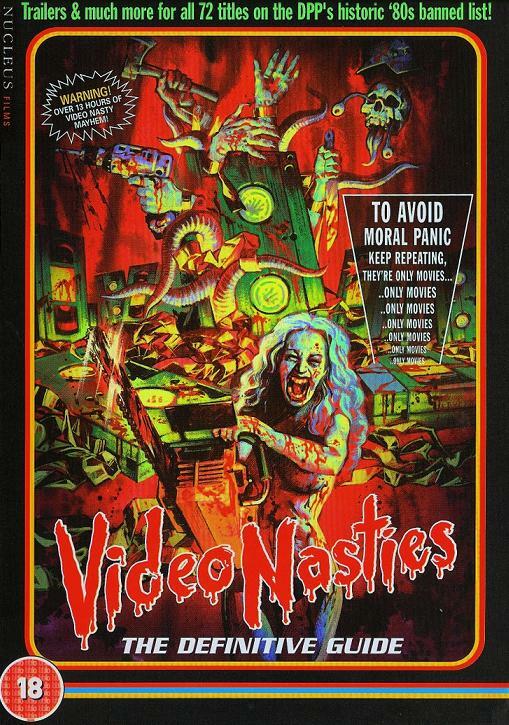 You'll have to own a PAL region-free DVD player to enjoy Video Nasties: The Definitive Guide here in the states, but it's highly recommended if you have the tech. It's still available to order on Amazon's U.S. site - but I'm not going to link to Amazon here. I'm afraid you're on your own for that leg of the journey. So get your hip-waders on and gear up for the Ultimate-Gore-A-Thon. We'll begin shoveling the bloody chum on Saturday night at midnight. The Dog Farm's first post will be up at 12:01. Remember to visit all of the rest of the participating sites, be generous with the "Likes" and "Shares", and leave plenty of comments. Contrary to what Erin Lashley of Deep Red Rum claims, I'm pretty sure we're all comment whores.